Allitwares.com is one of the most professional portals, focused on all the information technology industry and related business. User can browse up-to-date supplier and product information on everything related to automotive electronics, electronics components, consumer electronics, computer and business automation, communication and networking, control and automation, security, semiconductor, electronic manufacturing equipment, test and measurement. Our mission is to create an on-line marketplace for linking buyers and suppliers together across the world. 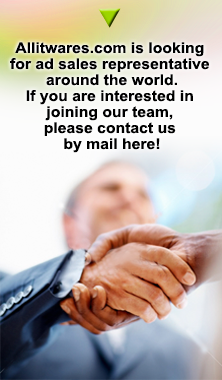 If you are an Exhibition Organizer, Magazine Editors, Freelancers, welcome to join in as our Partner. Sections of IT Market News, Design and Application Note and IT Trade Show of allitwares.com are designed for Magazine Publishing Company, Freelancers, and Exhibition Organizer to help you deliver your information to our users across the world. 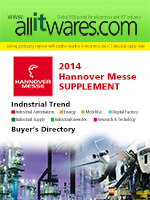 Post your exhibitions information or magazine articles on Allitwares.com, which directly hyperlink to your web-site. Increase page views at your trade show information and magazine articles to maximum traffic for your web-sites. Generate business opportunities for your physical products. Interested in being allitwares.com partner? Register As a Partner Now!! !